Sunday is my cooking day. I like to do a whole lot of nothing on Sundays to prepare for my work week. This is the most I do on my Sunday funday. Today is no different. Middle of NFL playoffs. Go teams! I hate that somebody has to lose, but I do like teams with those unexpected wins. New year and I should be looking at weight loss goals. Isn’t that what you’re supposed to do at the beginning of a new year? I think I’m having opposite reaction. I’m hungrier right now. Whew…I’m a growing girl…growing out, not up! One of my cooking ‘jobs’ I have is cooking for my dad. I cook a month’s worth of food for him. I put it into individual containers and freeze them. Makes his meal planning super easy. He has a standing order with me. He’s a simple ole farm boy. He likes what he likes. He has absolutely NO problem telling me what he wants and when he wants it. I ask him all the time does he need anything. Nope…he says. Then he gives me his food list and I have a small window to have it all done. I never complain and have to laugh to myself. He’s always so appreciative so how can I tell him no. Plus throughout my teenage years, he never complained when he served me my soggy cornflakes every day. I worked hard preparing his current wants: mac and cheese, carrots, and mashed taters. I have my own secret mashed tater recipe. I cook him five pounds at a time. He tells me they taste just my mom’s. I save some of those mashed taters for my hunka hunka. He’s a big fan of them, too. For our meal at home today, I opted for pork chops and applesauce. 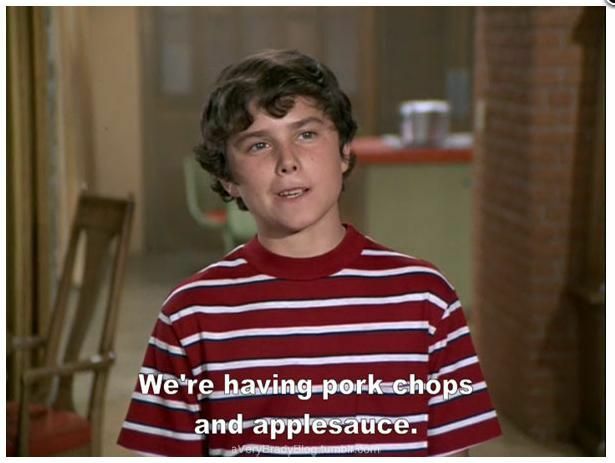 I know you just said it like Peter did in “The Brady Bunch”. If you didn’t, why not? I also served smothered green beans, mashed taters, and a salad. I found a new pork chop recipe. Easy peasy. I’m not normally a pork eater, but this recipe was too hard to pass up. As soon as I bit into that bite of tasty goodness…YUMMO!! That brown sugar glaze was so amazing. The pork was fork tender, which is typically not that way with pork. It’s been a great weekend of football playoffs. I hate for most teams to lose, but somebody has to, unfortunately. My hunka hunka and I have a fun rivalry. My team (Steelers) is already out so it’s all in good fun to me. I would love to see Chiefs go all the way because Mahomes is fantastic. I would love to see Rams, too, because McVay is a helluva coach. I love Brady, but he has won many times. My hunka hunka loves Saints, even though Brees has a super bowl win, and I enjoy watching Foles. Can there be multiple winners? Let’s get the week started off right! Good food. Good football. Happy bellies. Happy Daddy-O.